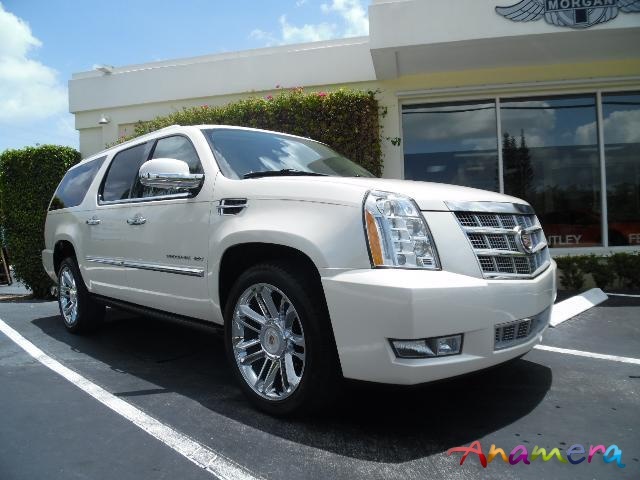 *** ONLY 35,936 MILES *** ESCALADE ESV PLATINUM AWD! REAR SEAT ENTERTAINMENT! SIDE BLIND MONITOR! POWER RETRACTABLE RUNNING BOARDS! 22” FACTORY CHROME WHEELS! HEATED/AC VENTIALTED SEATS! NAVIGATION! XM RADIO! CARFAX CERTIFIED! Finished in White Diamond Tricoat with Cocoa Leather Interior and Burl Walnut Wood Trim. Brushed aluminum trim to front dash. Wood/Leather trimmed multi-function steering wheel. Power sunroof. * White Diamond Metallic Exterior Paint. * Power Retractable Running Boards. * Rear Seat Entertainment System. * Side Blind Assist Monitor offers Blind Spot Assist with Blind Lane Warning System. * All Weather Floor Mats. * 22” Factory Chrome Wheels. All the standard luxury features including power retractable assist steps, power adjustable pedals, 14-way powered front seats with heated/AC ventilated cushions and backrests. 2nd row dual bucket seats with heat and 3rd row three passengers seating. Tri-zone automatic climate control. Auto-dimming mirrors. Navigation System with Bose 5.1 Surround Sound, Bluetooth and SiriusXM Satellite radio. Power lift-gate with lift-glass, remote keyless entry and tire pressure monitor. HID headlamps with Intellibeam headlights. All Original. Carfax Certified. Superb! We are export specialists and proven experts in shipping vehicles worldwide. For additional details, reference letters, and to view our inventory of over 90 luxury certified vehicles, please go to www.chariotsofpb.com or please call us at 1-561-640-1090.